When the Senate blocked Kevin Rudd’s plan for an Emissions Trading Scheme in December 2009 he – and, as he insisted on Q and A last night, his colleagues – hesitated. Or froze. But they did have an alternative. And the alternative would have saved his Prime Ministership. I’m convinced of the proposition. an alternative to show that his government was still committed to climate change action . In December 2009 Prime Minister Rudd could have said that adopting the NSW GGAS Scheme was his alternative to a full scale ETS until the Senate came to its senses and allowed passage of his twice-blocked bill. In the meantime, the NSW scheme would be applied nationally. The GGAS scheme, launched in 2003, was in fact the world’s first carbon trading scheme, coming two years before the EU’s ETS. It is a ‘baseline and credit’ system, which works by requiring NSW electricity suppliers (that is, electricity retailers) to reduce their greenhouse emissions per customer. Otherwise they have to invest in offsets, such as authentic carbon- capturing plantations. Credits, in the form of NSW Greenhouse Abatement Certificates, are given when greenhouse performance improves on the emitter’s prior practice, or current industry practice. These certificates can be traded – that is purchased by other emitters. An audit of the scheme in 2009 showed it had saved or offset over 90 million tonnes of greenhouse gases since beginning in 2003. In 2009 alone, 15 million certificates were created from electricity generation projects – a 26 percent increase over the year before. If this had been the Prime Minister’s response in December 2009, it would have avoided that overnight six percent drop in popularity that was to come in April 2010 with the headline revelation about the government moving slyly away from the ETS. And Kevin Rudd would be Prime Minister today, heading a majority government. And we would be curbing carbon emissions from the biggest source, ready to expand this scheme into a fully fledged ETS as soon as the Green Party would allow it thought the Senate. while the NSW GASS scheme would have been a good second option, any option that included some real action would have been better then totally dropping it. Personally I do think that an ETS is a better way to go. At the time I think he should have rolled the dice and called a double dissolution election and run with it. I think he would have got the vote he needed. Undoubtedly a pragmatic solution – a functioning scheme with all the details of price and compensation already determined. But I doubt our partisan political system would have been able to cope with the idea of borrowing anything from the NSW Government. I’m sure the pres, the Federal Opposition and the other State Governments would have had a field day spinning it into a veritable web of conspiracy and innuendo. I agree with you about the ETS and its role in the events leading to the toppling of Mr Rudd. Your outline of the NSW scheme, and how something similar might have broken an impasse and saved Rudd is persuasive. 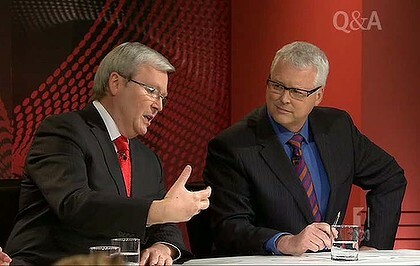 Annoyingly, most commentators (and voters) fail to remember that Rudd’s ETS was blocked by Senate. They prefer instead to accuse him of wantonly ‘dropping’ it, thus breaking faith owith his electors. Undoubtedly after being twice blocked, causing a stalemate, some of his inner circle urged him to walk away from it. The same crew then used this issue as part of the catalyst for toppling him. No wonder it ‘sticks in his craw’ when he’s continually, and wrongly, accused of breaking a comittment re ETS, as if without a reason. Especially since his colleagues who urged him to shelve it, then used this to help sharpen the knife they stabbed him with (“Et tu, Brute?” etcetera). Then to cap it off they recently announce a carbon tax with great fanfare, and crow about having “always supported some form of an ETS.” Come on, a man can only take so much! I don’t blame him at all for telling some plain truths on Q & A. Instead, everyone’s down on him like a tonne of bricks for having spoken up for himself. Shame! I’m dismayed by the short-term memory loss by most commentators, or their complete lack of insight into what actually happened.